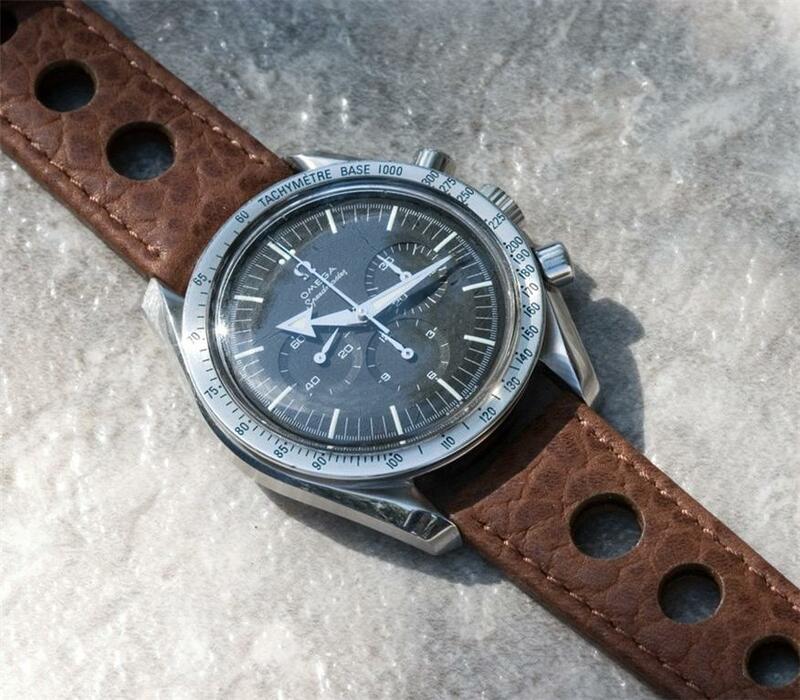 These are the type of rally bands made famous by the Heuer, Breitling and Omega chronograph racing styles. They come in solid colors, with smooth or calf grain leather, and your choice of matching or contrasting stitching. If you have questions or would like to see more pictures or styles, go to Squinky.com and please note some styles and colors are already sold out. SPECS: These straps are a perfect combination of style and comfort because of big holes and soft calfskin lining. The bands are fully stitched and have medium padding. 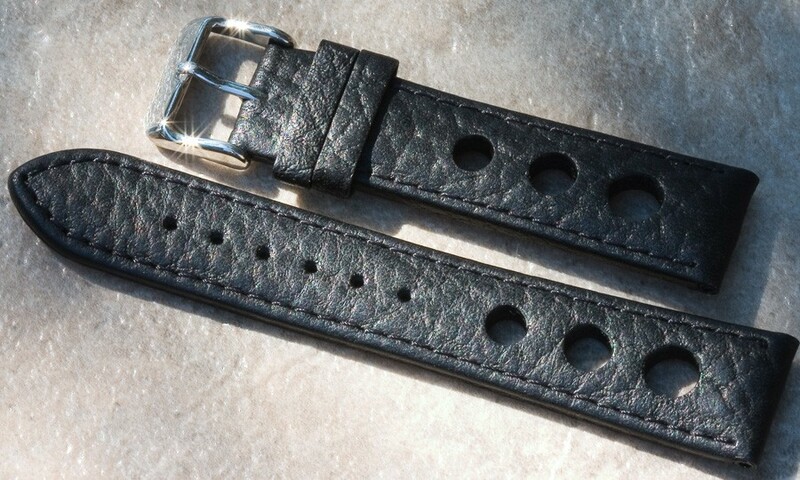 The thickness goes from 4.2mm at the tail to 4.5mm where the band meets the watch. 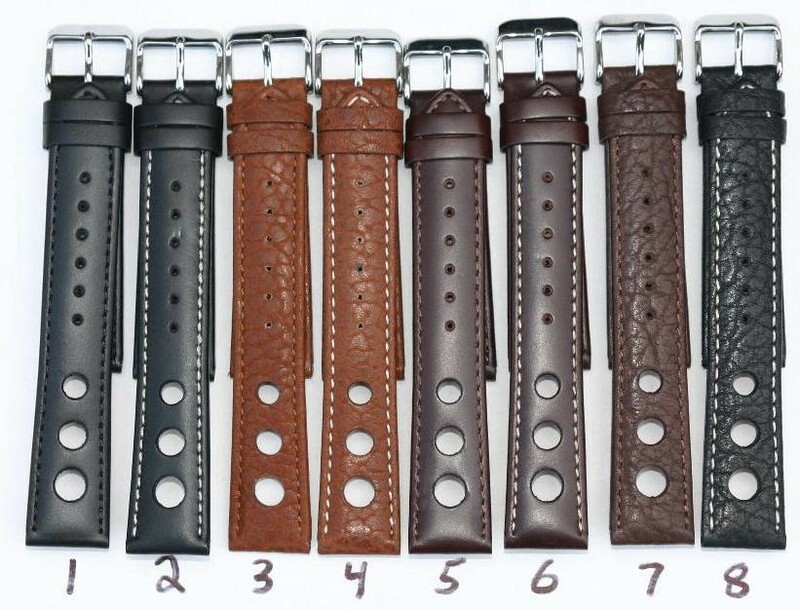 Standard length strap of 7 1/2 inches long (19cm), not including the stainless steel buckle. Metric measurement is 115/75mm. 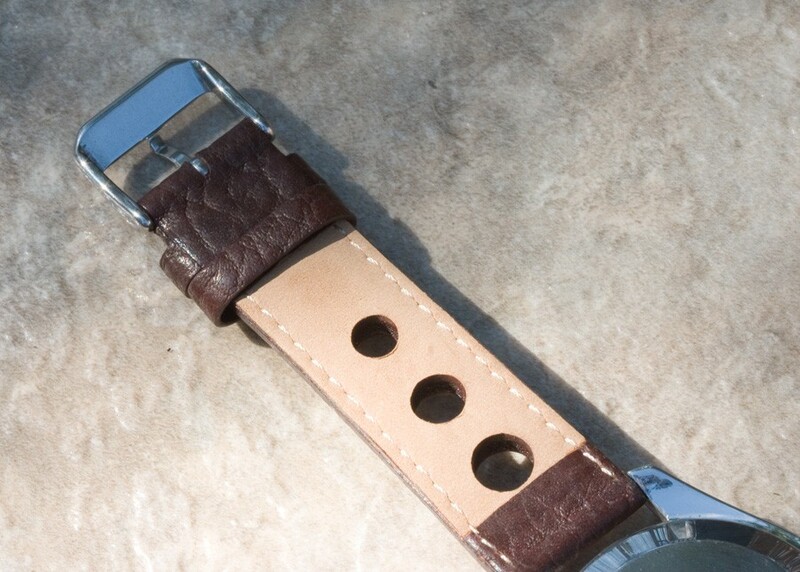 The buckle end of the strap is -2mm from the watch end size, if you want to fit a signed buckle. Select from the remaining styles in black calf grain, black smooth, tan calf grain, brown smooth or brown calf grain. UPDATE style #1 is sold out in 20mm and styles #2, #5 and #6 are sold out in all sizes. Style #7 is also available with white stitching. Don't miss out on these bands at this low price before the color and size you want sells out! 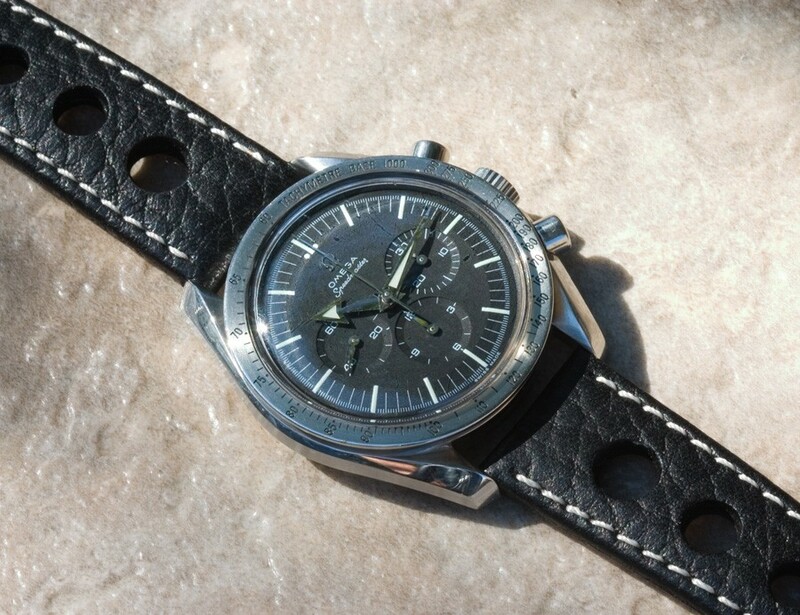 Email billmahoney@aol.com to get a quote to add a Heuer buckle to any 18mm or 20mm strap. BUY ANY TWO STRAPS AND GET FREE U.S. SHIPPING WITH TRACKING. Otherwise, $5.99 for USPS First Class shipping with tracking in the United States. 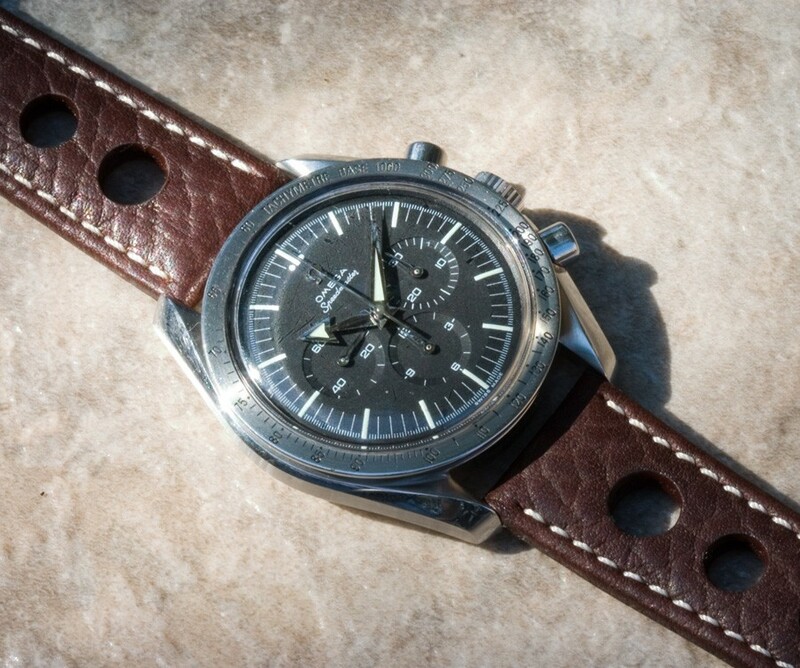 USPS Priority shipping in the U.S. for $13.99 for any number of straps. International shipping to most countries for $19.99 via USPS First Class International or $45 for required Registered shipping on larger orders or for shipping to certain countries. WANT AN ORIGINAL VINTAGE RALLY BAND INSTEAD? 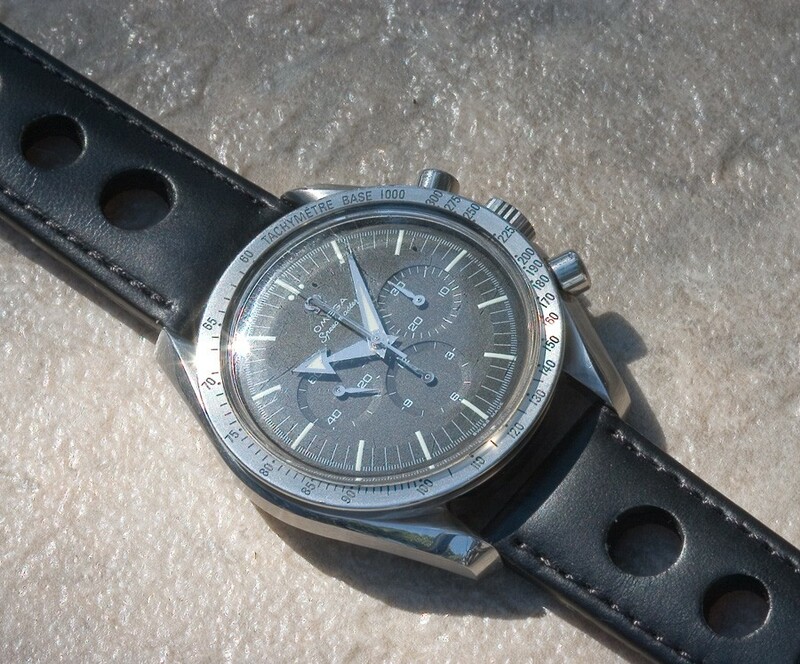 Browse the Heuer and Racing Straps sections at Squinky.com or email me at billmahoney@aol.com for information on the vintage 1960s/70s bands I have in stock for Heuers and other brands. Several colors and sizes 18mm to 24mm are available.